After the soaring rhetoric about the end of death and the final victory of God, we fall back to earth amid the clink of coins. What is this “collection”? As a perceptive student of these lessons, you will remember that in 1 Corinthians 9 (See Bible study lesson 9), Paul explains at length why he refuses financial support. Why is he now collecting money? Actually, this collection is a big deal for Paul. He devotes two whole chapters in 2 Corinthians 8 and 9 and much of Romans 15 to the collection he wants to take “to the saints in Jerusalem.” Paul manipulates his audience as well as any door-to-door salesman or telephone fund-raiser. He encourages his audience to put aside any extra money they make each week so he won’t need to hassle them when he gets there (1 Cor. 16:2). In 2 Corinthians 8:1-7, he tells them how very generous the Philippian and Thessalonian churches in Macedonia have been—they were “begging us earnestly for the privilege of sharing in this ministry “(!). Then he piles it on by reversing the situation in 9:1-2—how he boasted to the Macedonians, “saying that the people of Achaia [Corinthians] have been ready since last year!” Paul even puts off a visit to Rome in order to backtrack to Jerusalem first (Romans 15:25-29). Why is this collection so important? Acts 11:27-30 mentions a widespread and severe famine during the reign of Emperor Claudius, which hit Jerusalem quite hard. Before Paul started his missionary journeys, he and Barnabas had taken relief to the believers in Judea from Christians in Syrian Antioch. No doubt Paul wants to help the mother church survive financially. Paul offers to let his collection be carried to Jerusalem with letters by any approved Corinthian believers (1 Cor. 16:3-4). The trip will also be dangerous. 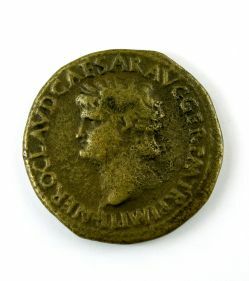 Money in the Roman Empire existed only in metals. There was no paper money, let alone checks or wire transfers; coins had to be lugged in bags to their destination. 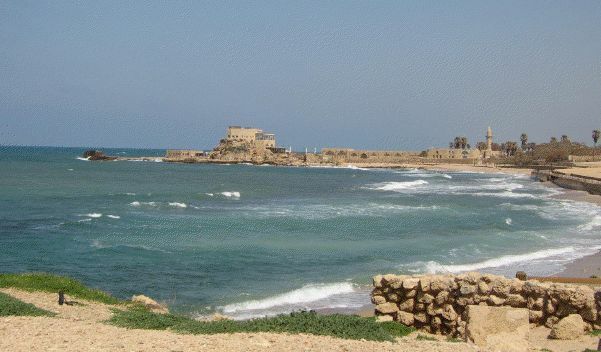 Some of the remains of the city of Caesarea, headquarters of the Roman governor in Palestine. Further details and final greetings. Paul cannot visit Corinth in person at this time. Timothy will represent him, though he apparently lacks Paul’s commanding presence. Treat him well! (16:10-11). Stephanas, Fortunatus, and Achaicus have all come from Corinth, and will carry Paul’s letter back to the churches there (16:17-18). Paul wants Apollos, the golden orator whom some Corinthians believers prefer to Paul (1 Cor.1:12), to return to Corinth with these brothers, but he refuses (1 Cor. 16:12). Does Paul hint at some rivalry between him and Apollos? The text is ambiguous. Paul is still in Asia Minor with co-workers, Prisca and Aquila (1 Cor. 16:19). Later, this couple will return to their native Rome after the death of Claudius and the lapse of the anti-Jewish edict—and set up another house church there (Rom. 16:3-5). If we assume the collection did not reach the Jerusalem church, what effect do you think this has had on Jew/gentile relations in the later church? How important to you is contributing to needy churches around the world today? My next and last lesson on Corinthians will trace the further relationship of Paul with his Corinthian house churches. What biblical document would you like to study next?